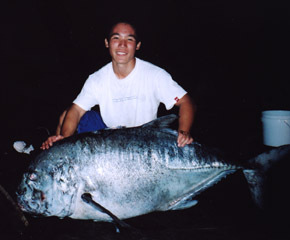 Richard Taga was only 16 years old when he caught this 109-lb giant trevally. He was fishing on the Ka'u Coast of the Big Island using a 12-foot Kilwell pole, Newell S550 reel and 80-lb test Ande line. The ulua bit a puhi (eel) bait that Richard had slid using a monofilament leader and 18/0 Mustad hook.